Bhopal the capital city of Madhya Pradesh suffered an accidental toxic gas disaster 30 years back. The gases released included mainly Methyl Iso Cyanate (MIC), Hydrogen Cyanide (HCN) and Carbon Mono Oxide (CO). The left over stockpile and products of reactions posed threat to environmental contamination and gases lead to heavy toll on human and animal lives and injured people with long term consequences. People believed that the toxicants could cause irreversible damage to human health. Present review article is based on extensive review of the large number of research publications and reports appeared over last 29 years following MIC gas leak at Bhopal. The results of extensive review of literature reveal that fear of carcinogenesis, immune compromise status was unfounded and congenital malformations was not proved epidemiologically as well as experimentally. And as on today, thirty years' post disaster only three health problems as Reactive Airways Disease Syndrome, Pulmonary Fibrosis and Post Traumatic Stress Disorder need further attention, that too for their management. The result of present review also indicates that by and large no research need seems to emerge. However, to be sure, author recommend that a cohort of gas exposed people who were given Thiosulphate injection (N = 18000) and their exposed family members may be assembled and their health status be examined through a cross sectional study to come to final conclusion. In recent years, many countries have suffered from various natural disasters. Disaster response has continued to face challenges in health care sector in all countries among which, information and communication management is a significant one. During the last decades, rapid advances in information technology have led to information management effectively and communication improvement in health care settings. Information technology is a vital solution for effective response to disasters and emergencies, so that if an efficient information and communication system is available it would be highly valuable. Of that, mobile technology represents a nearly computing technology infrastructure which is accessible, convenient, inexpensive, and easy to use. This article reviews the literature on the state of mobile health application in disaster management in some countries in 2014 by electronic search in databases such as: PubMed, Google scholar, Proquest, Science direct, etc. The findings showed that most projects have not yet reached the deployment stage, but evaluation exercises show that mHealth should allow faster processing and transport of patients, improved accuracy of triage, and better monitoring of unattended patients in a disaster scene. Since there is a high prevalence of cell phones among world population, it is expected health care providers and managers take measures for applying this technology to improve patients' safety and public health in disasters. There are challenges in the utilisation of mhealth in disasters, such as lack of structural and financial issues among countries. In the present paper, we have discussed on utilisation of mHealth technology in disaster response. Quality in primary health care services is a key component in reducing all-cause mortality and disability cases. Quality in primary health care services is associated with adequacy of the features of primary health care and provision of preventive and promotive services. The purpose of the current study is to summarise the quality of primary health care in Uttar Pradesh (UP) and to identify important barriers that hamper quality service achievement. This review study was carried out in the year 2014 by searching Science Direct, PubMed and JSTOR, official reports and books. The search was conducted using the keywords primary health care, quality of primary health care, health indicators and barriers in health care delivery along with the term Uttar Pradesh and India. Studies were included if they address these pre-defined aspects of primary health care and published after the introduction of National Rural Health Mission in India. Therefore, studies, conducted before 2005 and not covered the aspects of primary health care are excluded from this review study. A total of 27 articles met the inclusion criteria out of 176 searched studies. The study results indicate that the quality of primary health care services is abysmally poor in primary health care setting of UP. The state has some of the deplorable health outcomes among the Indian states as consequences of poor quality in health care services. There are numerous barriers that impede quality services achievement and service utilisation. Crisis management is very critical for cities and countries according to the current situation of land and problems arising from urban industrialization and its effects on environmental factors such as global warming and the resulting natural disasters . Tehran is one of the largest and populous cities, with a daily population layer of 15 million people, and urban planning in crisis situation is an integral part of the management in this city. Before pursuing any lofty goals , crisis management is essential for ensuring the stability and continued success of an organization . Transportation or movement of people and goods from one point to another is an ancient and enduring characteristic inherent in human. Movement, in primitive societies to the basic form was regarded as the most basic daily requirements and a certain amount of movement was required to take place for the production or handling of any product from production to consume place to deliver needed goods to consumers. 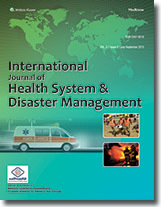 In this paper, by an overview of the theoretical papers on crisis management, crisis management approaches and models of crisis management, the importance of this issue is considered in bus transportation industries particular ly in Bus Company of Tehran, and a model in facing with crisis management is presented in the bus company by extraction of transportation management operational components. Aims: One of the best available alternatives to face the energy and environment problem is to tend renewable energies. The main aim of this study is producing biogas from garbage bioliquid (leachate). Materials and Methods: This study was conducted at wide range of organic loading rate (OLR = 0.93-25 g COD l -1 d -1 ) by varying hydraulic retention times (HRT = 23 and 12 hsr) and initial COD of 1.85-25 g l -1 . pH variations, COD, SCOD, rbCOD and VFAs degradation, biogas and methane production were considered in this study. Results: The COD removal efficiencies were in the range of 76-81% depending on loading rates applied. The maximum volumetric methane production rate (VMPR) of 5.7 l CH4 l -1 d -1 was achieved at the OLR of 19.65 g COD l -1 d -1 . About 85% of removed COD during the biodegradation was converted to methane. Conclusion: The results have shown that the anaerobic sequencing batch reactor (ASBR) reactor could be an appealing option for changing composting leachate into useable products such as biogas and other energy-rich compounds, which may play a serious role in meeting the world's ever-increasing energy requirements in the future. Introduction: Among adverse effects in mines and industries, silica dust often been the subject of many controversies. Its severe and incurable side effects call for special attention to as well as assessment and control in workplaces. This study aims to determine the rate of silica concentration in the breathing zones of the glass industry in a comparison to standard limits in order to improve the safety of workers exposed to these particles. Materials and Methods: Being conducted in a glass factory in Tehran, this research employed a sampling method to measure the silica dust diffusion in six consecutive years from 2005 to 2010. The most effective method of dust level measurement in a workplace is to take samples in the breathing zone of workers exposed to it. In the subject factory, the sampling was performed in four sectors with the highest level of occupational exposure to the respirable dust. (1) Material charging unit, Excavator Operator. (2) Miscellaneous material weighing Operator (mixer). (3) Material charging, loading unit Operator. (4) Discharge (unloading) zone. The silica compound sampling and measur was conducted via the method by National Institute of US Occupational Health and Safety (NIOSH). By this method, the silica particles in the air were collected on the sorbent tube containing activated carbon (coconut shell) SKC-USA No. 226-01 and the sampling pump Model 222 ml/count, SKC with a flow rate of two liters per minute in the active method for 30 minutes. Then, observing necessary conditions and the chain of cold (Stored at 4΀C), the samples were transferred to the laboratory. The breathing zone samples were also collected from the four mentioned sectors by the sampling pump. Samples were analyzed with the Flame Ionization Detector, when they were transferred to the laboratory by Gas Chromatography Apparatus with the Flame. Results: Time-weighted a Average (TWA) exposure was at its highest level in 2009 and at its lowest level in 2008. Findings of the study also revealed that the amount of environmental silica dust threshold limit value in the material charging Unit of loading and Excavator Operators in the discharge zone was higher than the threshold limit value. After determining the dispersion density of suspended silica particles, TLV, TWA, and the non-cancer risk ratio of the particles in the mentioned sectors, control strategies and corrective suggestions were proposed. Conclusions: Results showed that, the silica concentration in the breathing zone of the glass industry was higher than the threshold limit value. Silica is a carcinogenic material causes chronic respiratory diseases and silicosis, therefore it is recommended to observe the safety principles and use wet silica in stead. The concentration of silica is at its highest level in the loading and unloading units, thus the engineering and managing controls should be utilized to avoid the direct exposure to these suspended particles. Moreover, the workers in these sectors should be well-trained regarding the exposure to silica and use of individual protective equipment. Introduction: A quarter of the world's population experience one-hour change of time twice a year (due to daylight saving time or DST). Disruptions in the circadian rhythm may have harmful impacts on health. Circadian rhythm disruptions caused by changed biological clock lead to a change in sleep quality and length, which might result in accidents due to fatigue, headache, and loss of care and consciousness. Through transitions into and out of DST plan, the environmental and social clock change biannually. According to the review of literature, transition into and out of DST plan disrupts balance in circadian rhythm and may lead to sleep disruptions. Therefore, the aim of this study is to explore the effect of DST plan on the occupational accidents experienced by the workers in Mines and Mining Industries Development and Renovation of Organization in the months before and after DST transition. Materials and Methods: In this survey, using the databank of Iran's Organization for Development and Renovation of Mines and Mining Industries, we analyzed all occupational accidents during 9 years, from 2003 to 2011 in the months before (21 st February-20 th March and 23 rd August-22 nd September) and after DST (21 st March-21 st April and 23 rd September-23 rd October). Moreover, the year 2006 in which DST was not implemented in Iran was compared with other years. Results: The results yielded through statistical tests suggested that the number of occupational accidents had no significant increase in the months before and after DST during these 9 years, and there was no significant difference between 2006, when DST did not occur in Iran, and other years (P > 0.05). Conclusion: The study findings reveal that DST experienced by the workers at industrial factories, the risk of accidents and that of occurrence of severe occupational accidents do not significantly increase. Context: Women participation in disaster risk reduction has been stressed as they are the 'invisible force of resilience'. A sizeable number of the women in Delhi are homemakers. Objective: To study disaster preparedness amongst the women who are homemakers in a part of Delhi, India. Study Design: Cross-sectional community-based study. Setting: Four residential areas in east Delhi. Participants: Total 754 homemakers aged 18 years and above. Results: Amongst the women, 22.7% were illiterate while 19.7% had done college graduation or higher studies. The level of concern amongst them was highest for earthquake, fire and swine flu. Just 2.7% had the confidence that their household is well-prepared for a disaster situation. The top reasons for not being prepared were 'nothing can be done during a disaster', 'disasters are God's will' and 'will prepare only after seeing a disaster'. Only 15.1% had a family member trained in what to do in case of a disaster. Conclusion: The current analysis revealed several gaps in the women's preparedness. The adoption of positive behaviour by homemakers can directly impact the well-being of their family and their community. Introduction: Today violence is considered as one of the issues relating to health and occupational safety of the people and is also one of the existing occupational hazards in hospital. Therefore, the present study was conducted to investigate strategies of reducing violence in hospital from the viewpoint of support-administrative staff to take necessary actions for removing and reducing it using the obtained information. Materials and Methods: The study was conducted qualitatively with semi-structured interview and opinions of 10 authorities and employees of support-administrative units in Alzahra Hospital about violence reducing strategies were collected. Thus, the contents were transcribed after interview and then the interview data was reduced and structured using thematic analysis. Results: Views of the people about necessary strategies and actions for reducing violence in hospital were studied and classified as 46 subthemes and 11 themes in three groups: Necessary action for preventing violence, necessary actions at time of violence and necessary actions after violence. Conclusion: Considering high prevalence of violence in hospitals and although it is not possible to remove violence completely, this issue should be considered by the policymakers in the country, suitable reporting system and a proper instruction for preventing and confronting with violence should be prepared in the hospitals and necessary actions particularly necessary actions after violence which have been neglected so far should be taken to reduce probability of stress and violence in hospital considerably. The frequent occurrence of damaging natural and technological hazards clearly demonstrates the urgent need of study of multi-hazards vulnerability assessment methods to effectively reduce the impact of multi hazards in the built envirenment. This study presents the Multi Hazard Casualty Model (MHCM). Two types of hazards will be assessed, namely earthquake and fire following earthquake. Our objective in this paper is to present the casualty model, to analyse the applicability of casualty model for the assessment of multi-hazards vulnerability of building and human with a GIS-based Analysis. Methods used in this paper are based on theoretical approach and documentation. The approach used for casualty model is based on semi-quantitative and quantitative analysis. The analytical vulnerability model use building damage and consequential triggering hazard (e. g. fire) for the evaluation of human casualties. An attempt to develop casualty model based on interactions among hazards and/or domino effects. To this task is to correlate second hazard casualties directly with triggering hazard. The focus is on indicating hazard relations to understand how potential hazards of various degrees and magnitudes might result in MHCM. It incorporated considerations for multiple and cumulative hazards occurrences into the overall assessment framework and methodology. Triggering (domino) effects, and building vulnerability are two major factors that can lead to effected casualties in MHCM. The model is implicated with data collected in a part of Shiraz City. The casualty model shows that structural failure is the primary cause of earthquake built environment casualties and that physical damage potential should be the foundation of estimation fire followind earthquake casualty. Other factors should also be integrated. In the present study has been done to present the casualty model and to analyse the applicability of casualty model for the assessment of multi-hazards vulnerability of building and human.